Delaware State Police say that along with Dagsboro Police, they have apprehended and charged a California man on numerous drug related offenses following a traffic stop in Dagsboro on Sunday afternoon. Troopers say 57-year-old Charles Mulvihill of Ukiah, California was pulled over in a tan Ford F-250 with California tags shortly after 1:30 p.m. on DuPont Blvd. Law enforcement officials had determined the driver was operating the vehicle while on a suspended license. The driver later confirmed he was on a suspended registration and did not have proof of insurance. Police also determined the vehicle was required to be outfitted with an ignition interlock device, but was not. A police search of the vehicle uncovered a prescription bottle containing oxycodone pills which were not prescribed to the suspect, an electronic money counter, several ledgers and 1,000 dollars in cash. 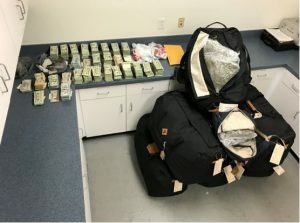 Police also discovered six large duffel bags containing 98 vacuum sealed bags containing various quantities of marijuana, totaling 212 pounds. Further search also uncovered 276,000 dollars in cash hidden inside the truck. Mulvihill was committed to Sussex Correctional Institution in lieu of 81,701 dollars secured bail.